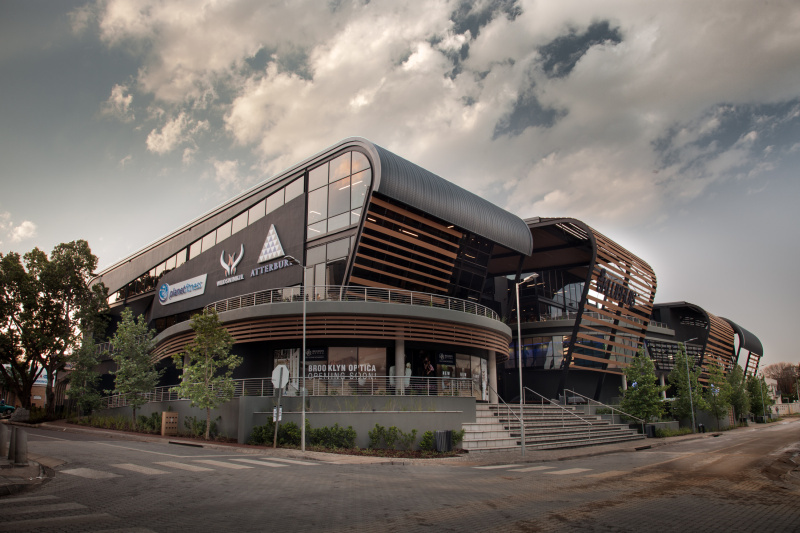 Atterbury’s new head office, Die Klubhuis, is a retro industrial building designed to stimulate collaboration and enhance efficiencies, while consolidating the property developer’s two Gauteng branches into one in its own mixed-use precinct development, The Club, in Hazelwood, Pretoria. The 5 200m² building also houses a Planet Fitness Megaclub on the northern side of the building, with a running track along the perimeter of the building, as well as A-grade office space on the southern side. Atterbury occupies the entire second floor, with a café and entertainment balcony situated on top of the gym. Designed by Tony Hofman, Die Klubhuis features dramatic canopies that create a covered gathering space at the entrance to the building. Inspired by the curved roof of the retail portion (1st phase) of the precinct, Hofman created spectacular curved facades with steel portals that accentuate the roof segments, which are divided by concrete box cutters with monitors, which allows lighting deep into the building. The two mushroom pods are intended to stimulate creativity. Because of the tight bend of the steel beams on the facade, the curved portion of the I-beam was manufactured offsite with two bench plates on the sides, which then connected to the main I-beam. “The whole portal was hoisted into position using cranes, putting this ‘Mecanoo’ set together,” says Hofman. Klip-Lok seamless Chromadek sheeting was continuously rolled and the cranks around the curves curved on site. To accentuate the feeling of an industrial building that was repurposed into upmarket offices, materials chosen included matt black steel, glass, exposed concrete and timber to create warmth inside the building. For the wooden slatted ceiling, pine wood was baked in an oven to extract all the moisture and create lightweight planks, and then treated with a fire retardant. Underneath, the exposed services were suspended and combined with bespoke steel mesh. The same mesh was used around the lift to provide an open-air feel and was made from high-carbon steel with openings no larger than 6mm. An eye-catching dome, by David Krynauw, provides a pause area. 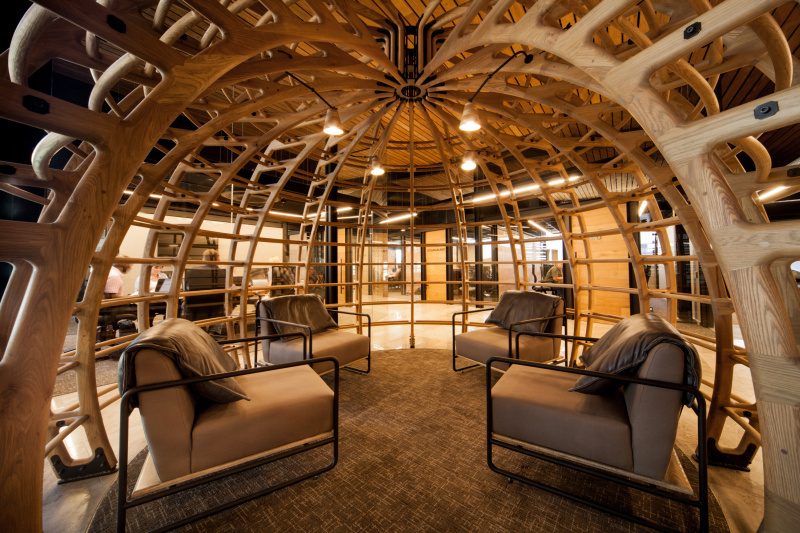 Interior architect, Gysbert van Graan, and interior decorator, Wytzke van Wyk, acquired a number of David Krynauw’s wooden creations for the office, including the benches at the entrance, boardroom and café chairs, and a big dome in the foyer that serves as a waiting or pause area. The boardroom tables and servers were created by Pierre Cronje. For an edgy feel, a marble element was also incorporated against some of the boardroom walls. Another highlight is the metal dividing wall between the front of house and the offices at the back. When standing back, one can see the word “Atterbury” subtly written in the perforation of the wall. 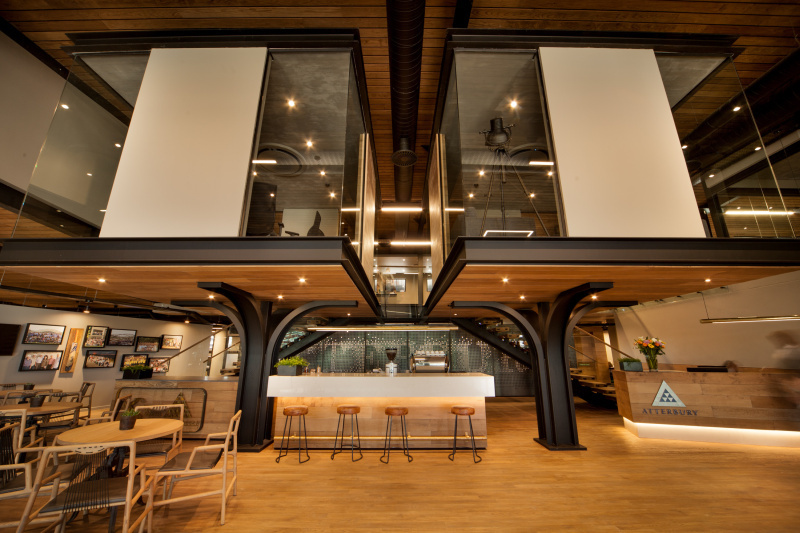 Filling the volume above reception, two “mushroom” pods serve as refreshing think tanks where the feeling of “sitting high” is intended to stimulate innovation and creativity. Full thanks and acknowledgement are given to Atterbury, Tony Hofman Architects and REDDECO for the information given to write this article. Caption main image: Die Klubhuis features spectacular curved facades.